I have a Windows desktop application that can handle multiple files open on one canvas (in one instance of the program). You can modify and save each file individually, or all in one go. If a user has multiple files open on this canvas and chooses to close the program, normal behaviour from other programs (Adobe Fireworks, Microsoft Word etc.,) shows a separate dialog box for each file that is unsaved. So if there are three files, three dialog boxes are displayed for "Do you want to save file xyz?" Do you know of any other programs that handle this situation a bit smarter? 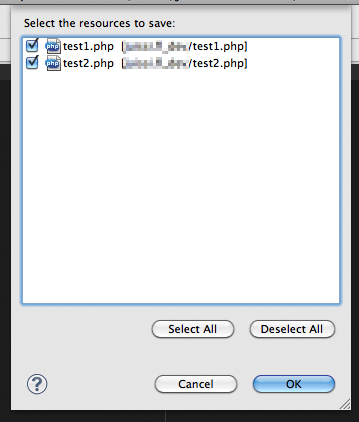 Like a single dialog box to save multiple files? Or is that too smart, and should I stick with the default behaviour? There is no real limit to the amount of files a user can have open; it's only limited by your hardware memory. The great Aptana Studio has this kind of multiple choice prompt when closing several unsaved files. Love the way how you can Select All and Deselect All to swiftly select only a selection. Also the default of having all unsaved files checked by default is reasonable - most likely users will in fact want to save before exiting. I recommend not doing away with the typical exiting behavior without a good amount of user testing the new proposed behavior. For many editor type applications the typical one-dialog-per-open-file on exit is hard to improve on. The exiting behavior of Photoshop (which I happened to be using at the moment) brings to the top each unsaved image with the dialog on top of it allowing me to save it, not save it, or cancel the exit. If this were condensed into a single dialog I probably wouldn't be able to see all the files/documents in question. In some cases this could be very distressing and I'd be inclined to cancel the exit and "manually" close all my open files, thereby foregoing any convenience the new behavior promised. And is it really that desirable to facilitate a quick exit with 4 or 5 or more files unsaved? I like the idea that it is smart. But you have to give an option to choose file-by-file as well. I think you should definitely go with it, unless your users are old, or not good users. Not the answer you're looking for? Browse other questions tagged desktop-application save files close exit or ask your own question. Saving & restoring undo stack — good or bad? Why don't mobile apps have a 'close' button? Appropriate Icon for “Load” Button? How to handle a lot of generated report files?